A thoroughly rampant Queens side eased into the next round of the Irn Bru Challenge Cup as they overwhelmed visitors Stenhousemuir in one of the most one-sided games Palmerston has witnessed for many a season. Two ahead inside the opening ten minutes, and four -nil in front at the break, the home side completely dominated the game from start to finish. This was a game in which Queens looked as though they might score with every attack, and had they made all their chances count, then they would quite easily have taken their scoring into double figures. 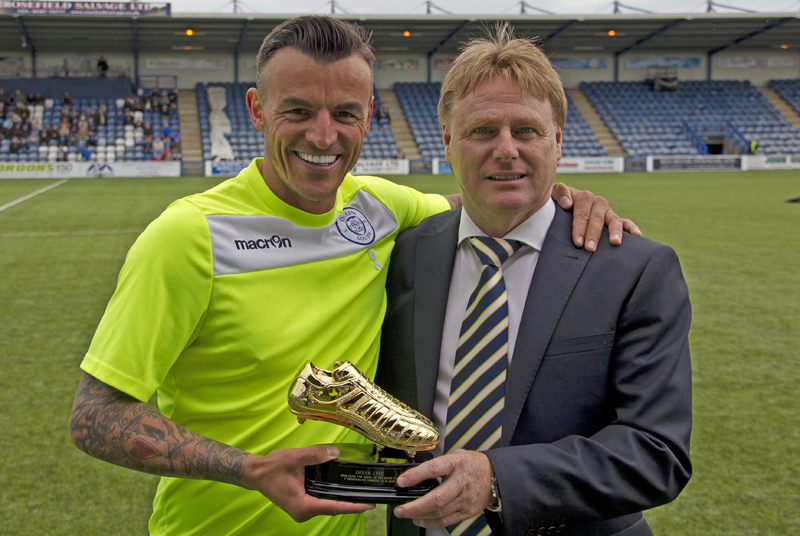 Before kick-off Derek Lyle was presented with a `Golden Boot` to commemorate the scoring of his 100th goal for the club at Dunfermline last time out. Manager, Gavin Skelton made just one change to the team that started at East End Park last weekend with Lyndon Dykes missing out through injury and Dale Hilson taking his place as Queens lined up in their preferred 4-4-2 formation, and it was Hilson who had the first half chance of the game after good play involving Derek Lyle and Stephen Dobbie, but Hilson`s close range shot was charged down and eventually cleared. The hosts might have gone ahead following their next attack when Andy Dowie`s header from Jamie Hamill`s free kick lacked the power to beat `keeper McCabe, but less than a minute later they broke the deadlock. Stephen Dobbie found Dale Hilson with a perfectly weighted pass and he cut in from the left skipped past two defenders and curled a superb effort past the diving McCabe to score his 2nd goal of the season. Just 10 minutes into the game, Queens doubled their lead. A delightful cross field pass from Kyle Jacobs picked out Grant Anderson on the right and after taking the ball in his stride, he checked back inside and drove a 20-yard shot past the despairing dive of `keeper McCabe. It was a dream start for the home team, and virtually the whole of the opening 10 minutes of the clash had been played out inside the Stenhousemuir half, and as the tie continued, so did the dominance of the now extremely confident Queens team. 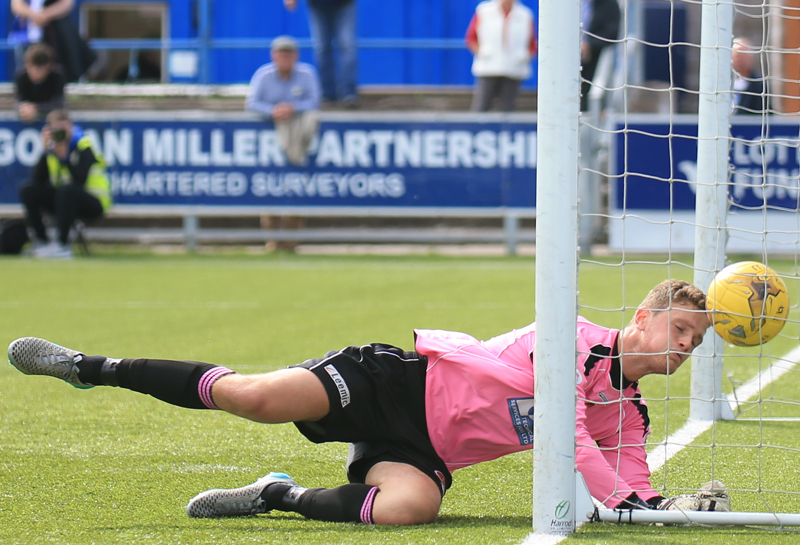 Visiting `keeper McCabe was almost caught out when put under pressure by Dobbie, but fortunately for him although his attempted clearance hit the Queens striker, the ball spun back past the goal. The link up play between Dobbie, Lyle, and Hilson was a joy to watch, and all three were causing problems for the visitors, but for all the intricate passing, and inventive play that they produced, it was route one football that saw Queens go close to adding a third goal on 26 minutes. Lee Robinson`s long kick was flicked on by the head of Lyle into the path of Dobbie, and his shot from the left across goal was only inches away from nestling inside the far post. The away side finally enjoyed some possession of the ball and were able to win their first corner of the contest, but a poor delivery which was easily collected by Robinson, kind of summed up their early involvement in the game. Queens won their first corner of the game following their next attack and although Jacobs got clear of the defence, he could only guide his near post header wide of the target. 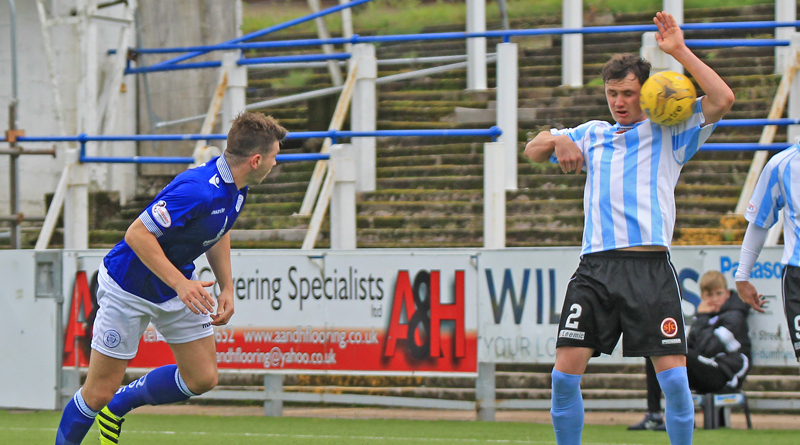 Scorer of the second goal, Grant Anderson, came off second best during an aerial challenge which clearly caused him some discomfort, but after some treatment he was fit enough to continue. It seemed as though a third goal was coming such was the dominance of the hosts, and as the two strikers linked up again, a third goal duly arrived. The pair exchanged passes and when Lyle`s flick sent Stephen Dobbie through on goal there was only ever going to be one outcome as his left foot strike hit the back of the net from 8-yards out. The game as a contest was probably over at that point, and Lyle might have added to his tally of 100 Queens goals twice in quick succession. Firstly his low drive was smartly saved by McCabe, and when the resulting corner fell kindly for him at the far post, his powerful half-volley flew high over the bar. However, `The Ton Man` would not be denied his goal and on 38 minutes, it became four-nil. 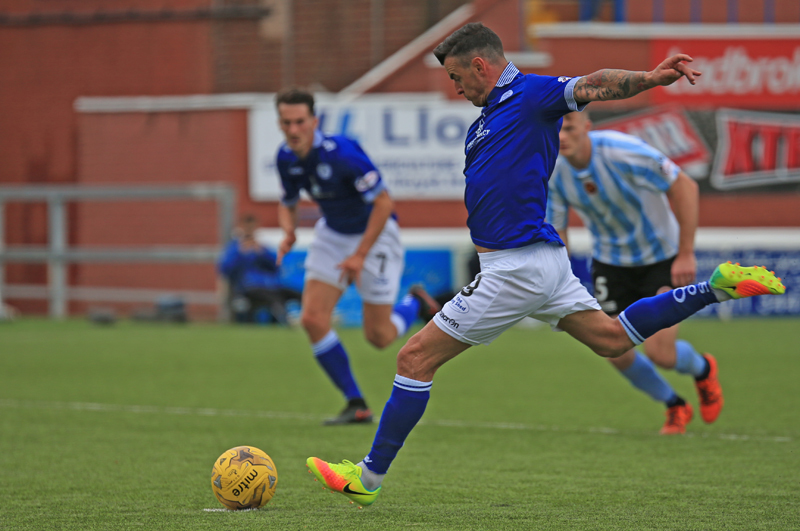 Anderson, Lyle , and Dobbie combined well to force a corner and when Hamill`s delivery was met by a header from Darren Brownlie, the ball struck the hand of a `Stenny` defender and referee Aitken pointed straight to the penalty spot. Derek Lyle stepped up to score his 6th goal of the current season to put Queens in a very comfortable position at the interval. Queens made a change at the start of the 2nd period as Owen Moxon replaced Grant Anderson, it was a straight swap and they continued with the 4-4-2 set-up. 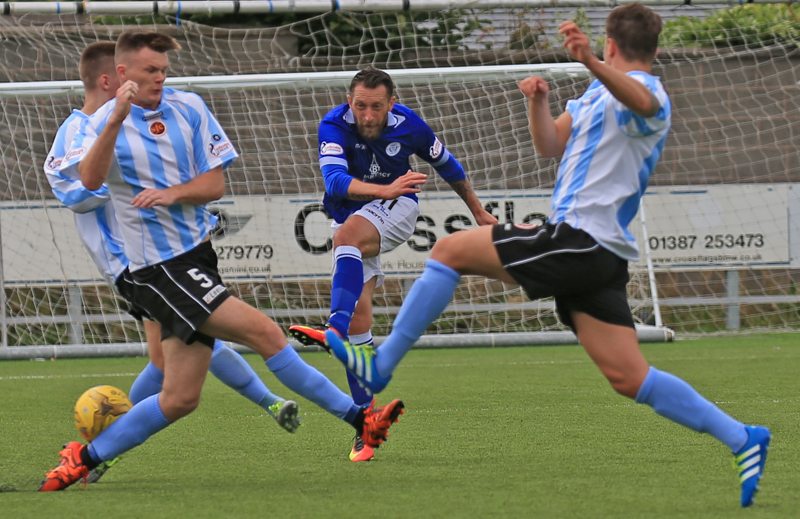 The half was barely underway when Queens added goal number 5 and once again, Stephen Dobbie showed fantastic composure when through on goal holding off a strong challenge before slotting the ball past the bewildered `keeper. The question was now all about how many goals Queens would plunder against what was a poor Stenhousemuir side and Lyle and Hilson combined well to set up Dobbie, but he was denied his hat-trick by a decent stop from McCabe. Jake Pickard replaced Kyle Jacobs in midfield, and although the tempo slowed a little, it was still Queens who were well in control. The visitors one bright spark was winger Alan Cook, and although he wasn`t able to be involved in the game very often, on the few times he was involved, he looked a threat. 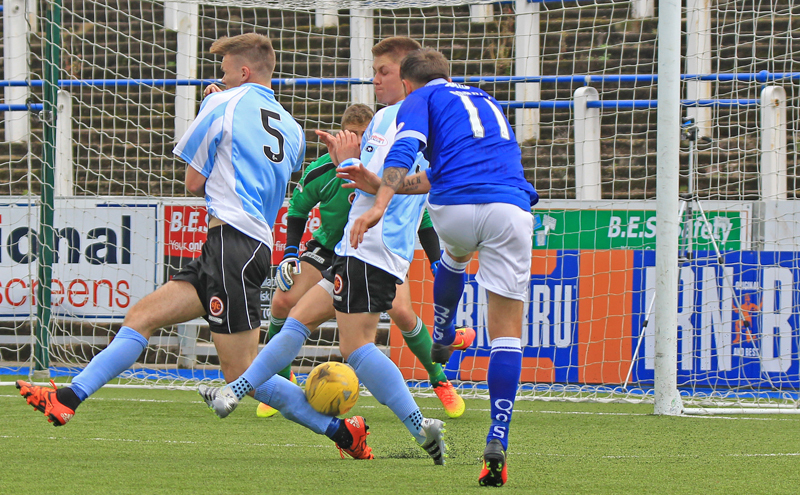 A left wing cross from Cook caused some problems in the Queens defence and Darren Brownlie`s sliced clearance could easily have gone in, but fortunately it cleared the crossbar. 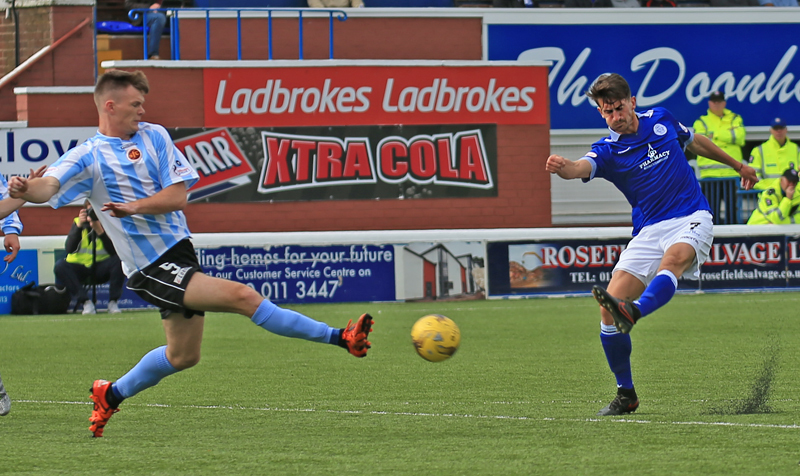 The third and final change for Queens saw Steven Rigg replace Derek Lyle for the last half an hour, and the striker wasted no time in getting involved in the action linking well with Dobbie and Hilson as the hosts searched for more goals. `Stenny` almost grabbed themselves a consolation goal, but Cook`s powerful strike flew into the side netting, much to the disappointment of the die-hard travelling support, and as if they were not suffering enough there was worse to come for the Warriors fans. A first time lay off by Dobbie fell nicely into the path of Steven Rigg on the right and some 20 or so yards from goal, but the striker showed great awareness to step inside and drill a low shot across the `keeper that nestled in the bottom corner - a super strike for his first goal for the club. It might have been even better for the former Carlisle player moments later when a jinking run from Jamie Hamill took him to the bye-line, but Rigg was unable to force the cross home and the visitors escaped again. Stephen Dobbie then saw a good chance to claim his third of the afternoon go begging when following a neat pass from Moxon, his shot was deflected just wide of the target, and as Queens continued to power forward, Pickard wasted a chance when he shot wildly over when well placed. The games only yellow card was shown to the visitors defender Fraser Kerr for a poor challenge on Rigg, and moments later the home fans in the crowd of 1158 were up on their feet acclaiming yet another goal. 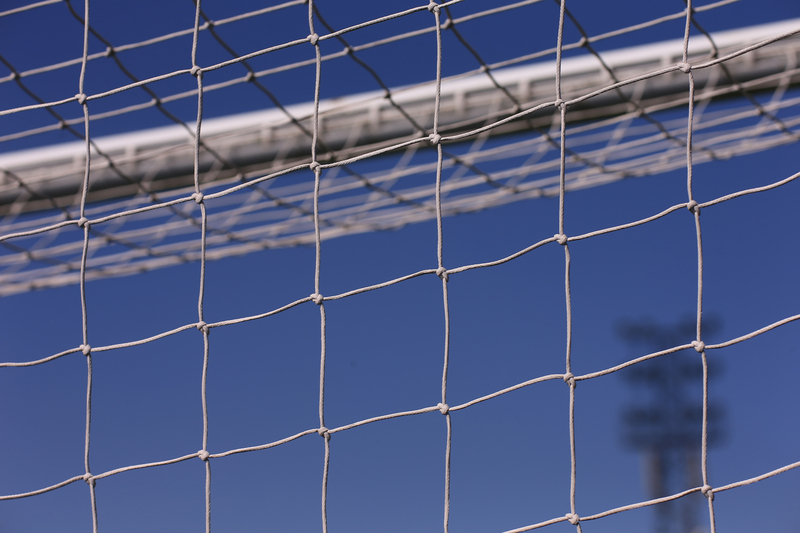 Moxon and Hilson were involved in the build up and when Steven Rigg won possession inside the area his mis-cued sliced shot lifted over the `keeper and into the net. 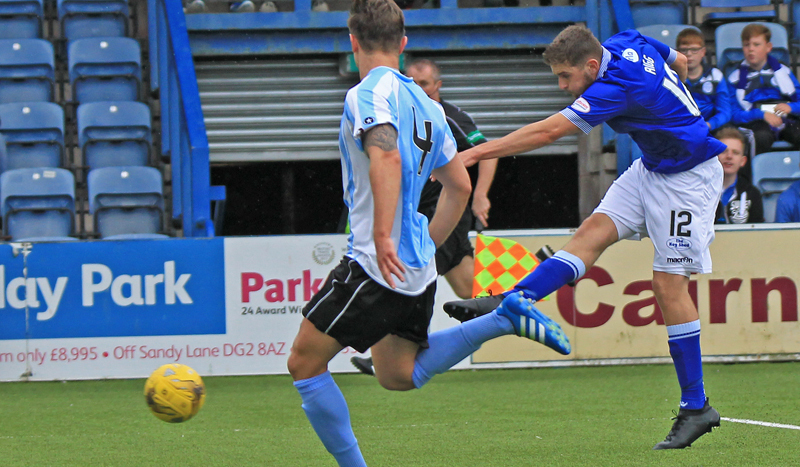 The only disappointment for Queens on the day was that they were unable to protect their clean sheet as 9 minutes from time, `Stenny` did find a consolation goal. Dale Hilson`s foul on Millar gave them a free-kick a few yards outside the penalty box, and fittingly Cook - who had been their best performer - curled a well placed effort past the Queens wall and beyond Robinson. 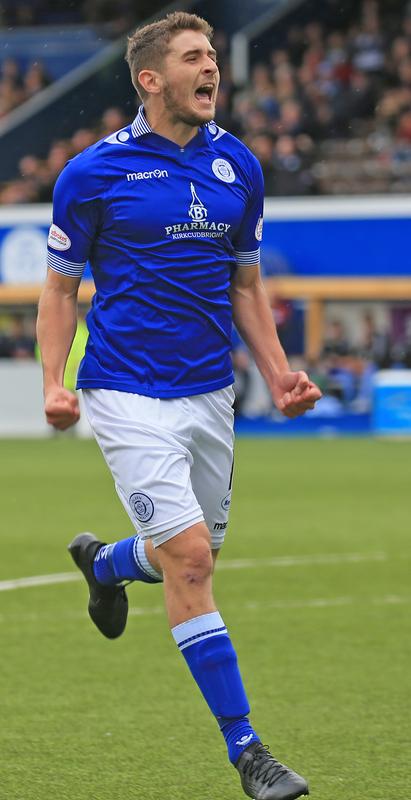 This was Queens biggest win since they last scored 7 against Clyde back in the 2008/09 season, and today`s victory made it 5 in a row in all competitions. The double for Steven Rigg now means that all of this seasons new - outfield players -signings have scored and although it is only 10 games in, 8 wins, 1 draw, and just 1 defeat has seen Queens get off to one of their best ever starts to a season. 14:28 One change for the Doonhamers today. Dale Hilson comes in for the injured Lyndon Dykes. 14:59 The player`s are out and we are only moments from kick-off. 3 min Lyle squares to Hilson but his shot is blocked by Meechan. 6 min Hamill swings in a diagonal ball, Dowie leaps the highest but is straight to McCabe. 7 min Hilson goes past two defenders and curls his shot into the top corner. 1-0. 11 min Anderson gathers the ball and his shot from 20-yards beats McCabe to his left. Great goal. 2-0. 23 min Dobbie nearly makes it three but his shot was just inches wide. 25 min Lyle`s cross is knocked out for a corner. 26 min Hamill flies in the corner and Jacobs is first to react and heads the ball over the bar. 32 min Hamill diagonal cross finds Hilson on the left but his square ball is collected by the `keeper. Still 2-0. 34 min Dobbie smashes the ball past McCabe to make it 3-0. 35 min Lyle`s shot is tipped out for a corner. 35 min Lyle volleys over from the corner. 39 min Lyle smashes home the penalty to make it 4-0. 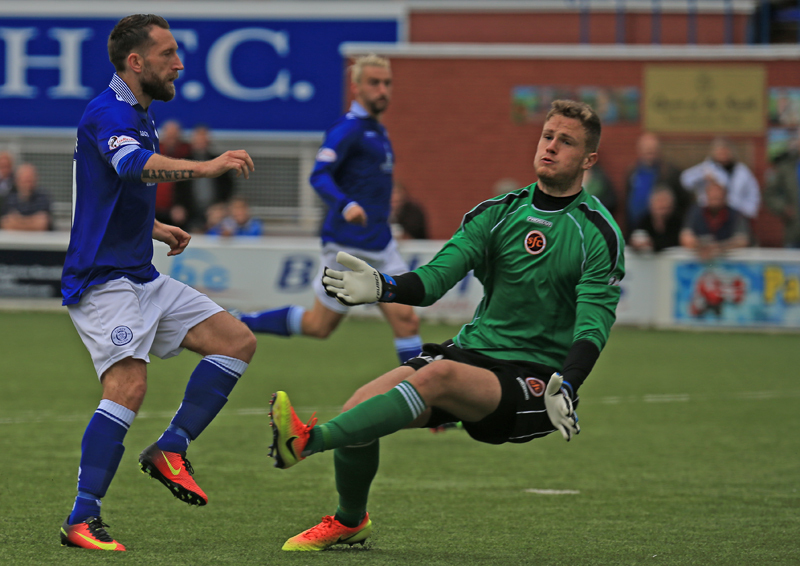 Half Time Goals from Dale Hilson, Grant Anderson, Stephen Dobbie and Derek Lyle give Queens a 4-0 lead at half-time. 46 min Cook`s dangerous cross is knocked out for a Stenny corner. 47 min Hilson does well to keep the ball in play but his square ball is blocked. 54 min Cook powers a shot into the side-netting. 55 min Ball into the box from Stenny but Kieran Millar heads wide. 59 min Dobbie plays it to Rigg on the right and he curls home his first goal for Queens. 6-0. 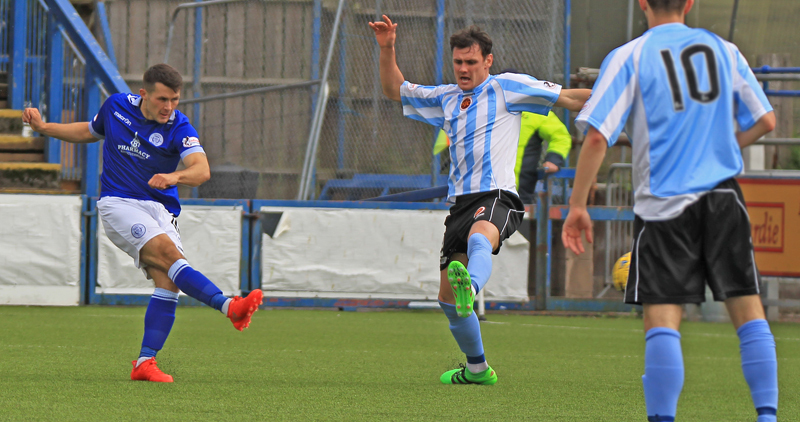 61 min Hamill crosses to Rigg but can`t get enough on it. 63 min McCabe gathers a long-range effort from Hamill. 63 min Moxon passes to Dobbie but his shot is deflected out for a corner. 68 min Pickard fires his strike over the bar. 70 min Kerr cautioned for a late challenge on Rigg. 71 min Rigg wins the ball in the box and slices in his second of the afternoon.